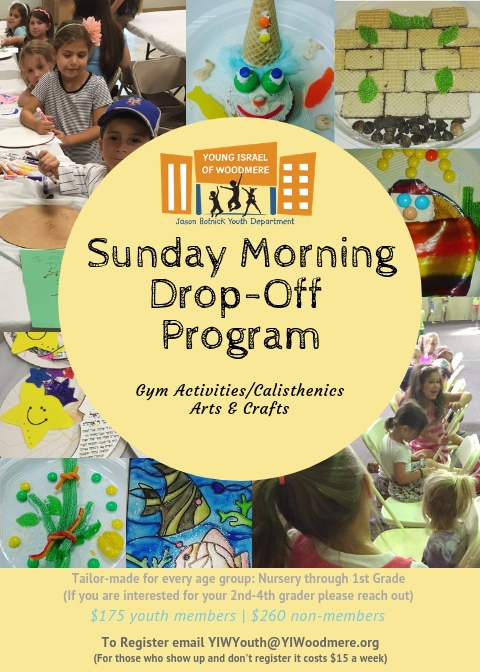 The Youth Department is excited to bring back our Sunday Morning Drop-Off Program. The cost for children who have already registered for the Youth Department is only $175 per child for the entire year! The cost for children not registered for the Youth Department is $260. If you’d like to register your child for the Youth Department (dues are $65 per child with a $170 family maximum) please click here to register before submitting this form. I acknowledge that my child assumes all risks of being injured while participating in Jason Botnick Youth Department Sunday Morning Drop Off Program. I agree to hold the Young Israel of Woodmere, its officials, coordinators and all other staff, harmless from any liability, loss, or personal expense arising out of my child's participation in the program.